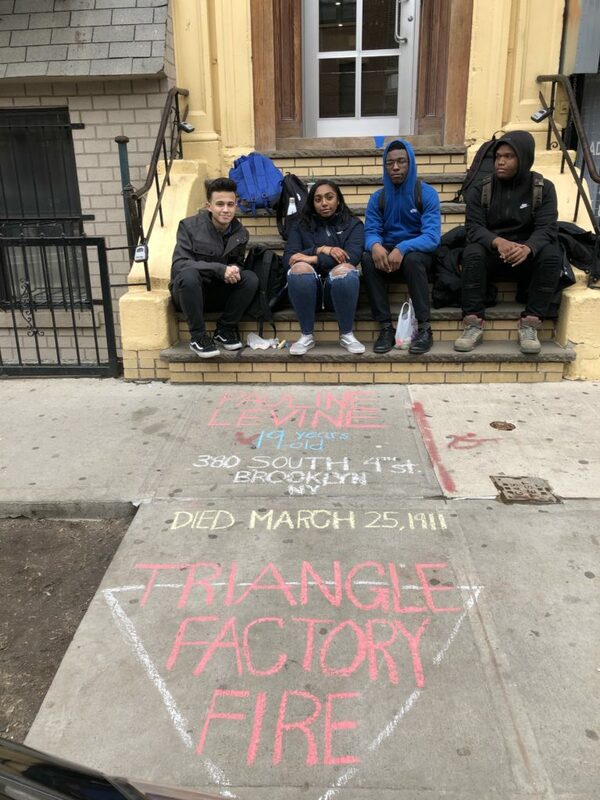 For the 2nd year in a row, The Williamsburg High School for Architecture and Design juniors/seniors took part in Ruth Sergel’s living art that commemorates the Triangle Shirtwaist Factory Fire. On March 25th, 1911 the Triangle Shirtwaist Factory fire took the lives of 146 workers, mostly young immigrant women and girls. The tragedy began a movement to deal with dangerous working conditions in the city. This commemoration is a capstone for the students following a unit of study on immigrant communities at the turn of the 20th century. This year our students commemorate the lives of seven victims of the fire, many coming from the same neighborhoods in which these students live. The following is Antonio Perez’s reflection on the day. On March 25, 1911, 146 young women died in the infamous Triangle Shirtwaist Factory fire. Most of the women who died were immigrant teenagers working for low wages in unsafe conditions. 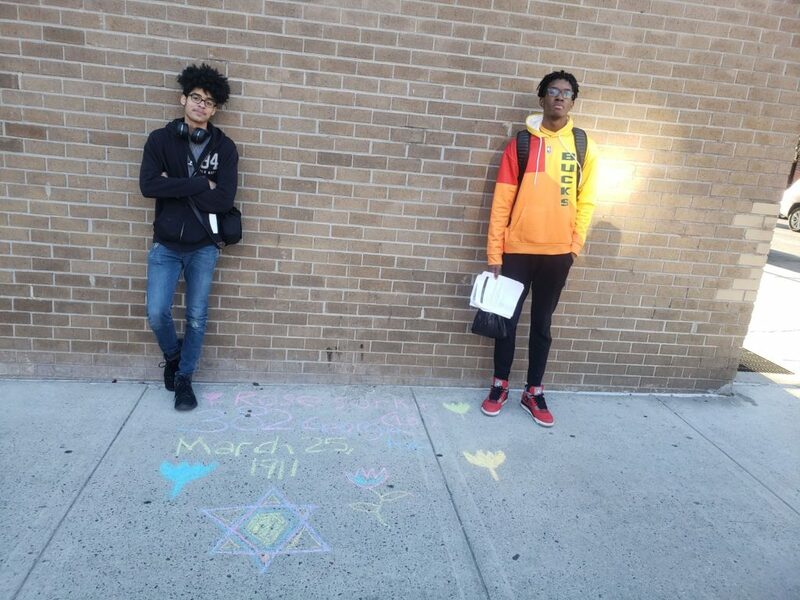 On March 25th, 2019, students from WHSAD joined together to honor the memories of those who passed in the fire. 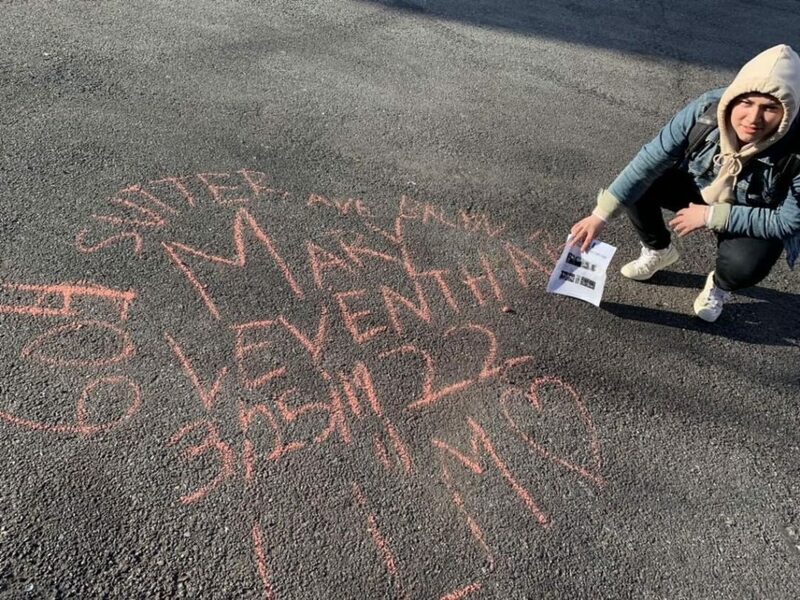 Students visited the houses of those who passed and covered the sidewalk in chalk in memoriam of their stories. We cannot allow ourselves to forget the tragedies that occurred regardless of how long ago. It is important that we remember and honor those from our past because we need to learn from their actions so we can improve. Because of the tragic fire, support of workers’ unions was strengthened and, although horrifying, because of it we have learned how to better prepare against catastrophe. Working conditions in factories are now more safe and have to comply with a strict set of guidelines; guidelines that were non-existent more than 100 years ago.